Break out the bibs: Lowcountry's Wrigleyville location is getting a sister in early 2018. The second outpost will serve the signature boil-in-a-bag crawfish, shrimp, crab legs and fixin's, this time with an emphasis on counter service. Specialty sides such as jalapeño honey butter cornbread will remain, while large-format cocktails and beer towers account for the beverage program. Lowcountry, 1132 S. Wabash Ave., Chicago, IL 60605, no phone. Bellemore in the West Loop is the latest opening from the Boka Restaurant Group (Boka, Girl & The Goat, etc.). In a luxe space, enjoy New American fare like brown butter braised cod with roasted cauliflower, fried hazelnuts, Meyer lemon and radicchio grilled with tamarind. Bellemore, 564 W. Randolph St., Chicago, IL 60661, 312-667-0104. Diners at Bites Asian Kitchen + Bar have something to chew on from January 1-31: half-priced ramen. The restaurant commemorates National Soup Month with specials on selections such as Creamy Tonkotsu Ramen and Five-Spice Duck Ramen. Bites Asian Kitchen + Bar, 3313 N. Clark St., Chicago, IL 60657, 773-270-5972. Del Frisco's Double Eagle Steak House gets even glitzier with the addition of an opulent Champagne experience: the Esquire Champagne Room, which debuted on New Year's Eve. The room specializes in decadent by-the-glass bubbles, including Krug Grand Cuvée, Veuve Clicquot La Grande Dame Reims and Dom Pérignon Brut Épernay. Bites range from lamb lollipops to caviar service. Del Frisco's Double Eagle Steak House, Esquire Theater, 58 E. Oak St., Chicago, IL 60611, 312-888-2499. In a stunner to the food world, Grace, considered one of Chicago's best restaurants, has closed following the announced exits of chef Curtis Duffy and general manager Michael Muser. The duo was reportedly in a dispute with owner Michael Olszewski. Duffy is working with his legal team to explore the possibility of opening another restaurant. 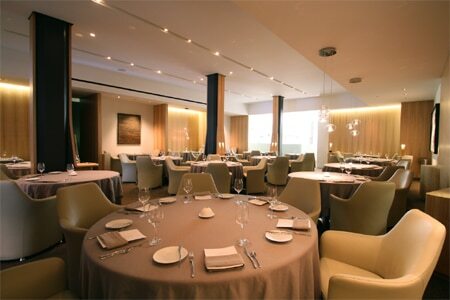 Grace, 652 W. Randolph St., Chicago, IL 60661, 312-234-9494.